When they say nothing can dampen the Filipino's spirit, they sure ain't lying. 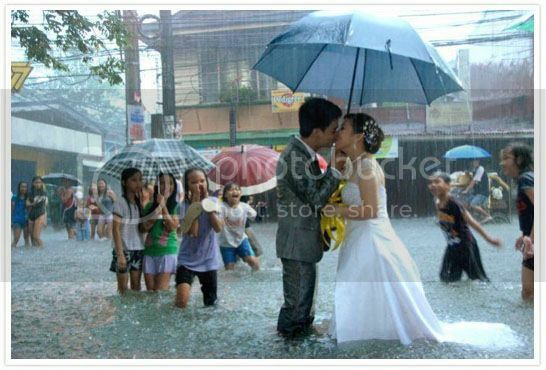 Just look at these two newlyweds, Hernelie Ruazol & Ram Ocampo. They were surprised after exiting their church wedding. Who wouldn't? There's a belief in Filipino weddings that rain on your wedding day is good luck, I guess this is heaven's way of pouring them years and years of more luck! Besides this sweet wedding, I'm so happy to hear that the flood is already subsiding and the sky's already cleared back home. Still praying for everyone's safety.